Women often don’t learn about potential health issues until after they are diagnosed with them. One of the diseases that usually flies under the radar is polycystic ovary syndrome, or PCOS. Women with PCOS have a hormonal imbalance that interferes with normal reproductive processes. It usually starts at puberty and is associated with irregular periods and other hormone-related symptoms. Between one in 20 women of childbearing age have PCOS. As many as five million women in the United States may be affected, and it can occur in girls as young as 11 years old. The cause of PCOS is unknown, but research is underway to uncover its origin. There is evidence that shows a link between certain forms of PCOS and family history, suggesting a genetic basis for the condition. Women with PCOS are more likely to have a mother or a sister with PCOS. Some teenage annoyances that follow you into adulthood like oily hair or persistent acne also count as symptoms. Most cases of PCOS can be diagnosed with a thorough evaluation of your medical history and symptoms, as well as a physical exam. A blood test may be required to measure the levels of various hormones. Your doctor will ask about your menstrual periods, weight changes, and other symptoms. 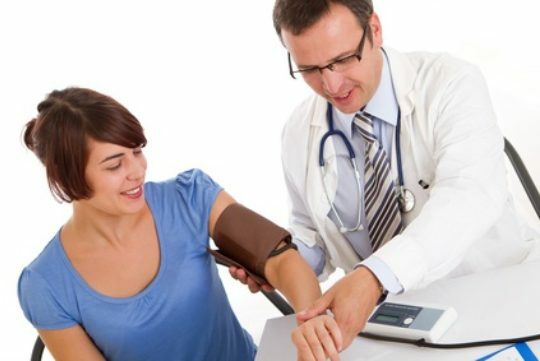 He or she will want to measure your blood pressure, body mass index (BMI) and waist size. PCOS is the most common cause of female infertility because of the body’s failure to ovulate. The ovaries, where a woman’s eggs are produced, have tiny fluid-filled sacs called follicles or cysts. As the egg grows, the follicle breaks open, the egg is released, and the egg travels through the fallopian tube to the uterus (womb) for fertilization. In women with PCOS, the ovary doesn’t make all the hormones it needs for an egg to fully mature. The follicles may start to grow and build up fluid, but ovulation does not occur. Instead, some follicles may remain as cysts. For these reasons, ovulation does not occur and the hormone progesterone is not made. But a diagnosis of PCOS doesn’t mean that you will never be able to conceive a child. Oral and injected fertility drugs are often effective in women with this disorder. The risk of heart attack is four to seven times higher in women with PCOS than women of the same age without PCOS. Women with PCOS have high levels of LDL (bad) cholesterol and low levels of HDL (good cholesterol). It’s important to discuss your health concerns during your annual gynecology visit. Your physician can help you address them to ensure that PCOS is managed effectively. Dr. Burton is board certified in Obstetrics and Gynecology. She is a retired staff member from Cleveland Clinic’s Ob/Gyn & Women’s Health Institute.